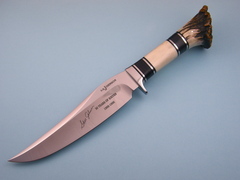 An amazing 30th Anniversary Commemorative knife by Steve Johnson. 30 years of knife-making from 1966-1996. 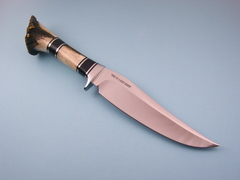 This knife has an elaborate handle with steel, leather and stag. 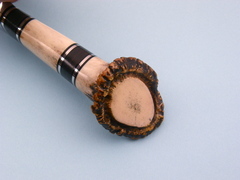 It is a nice Bowie shaped blade with Crown Stag .